Partners: Alameda County Resource Conservation District, Sunol AgPark Farmers, San Francisco Public Utilities Commission. The Sunol AgPark Case Study is designed as an information sharing tool to help farmers and ranchers, nonprofit and community organizations, government agencies and other entities interested in participating in, starting, managing, supporting and/or hosting urban-edge AgParks. It is also intended to inform broader audiences interested in supporting small scale beginning farming and in revitalizing urban-edge agriculture. 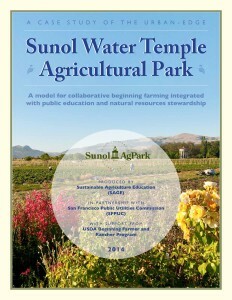 In this case study, SAGE tells the story of planning, launching and managing the Sunol Water Temple Agricultural Park (Sunol AgPark). SAGE distills lessons learned over nearly a decade of on-the-ground experience at the Sunol AgPark and many more years developing the Ag-Park concept. The urban-edge Agricultural Park (AgPark) aims to address some of the challenges of starting a small farm at the urban edge, while optimizing some of the opportunities of being close to urban areas. Urban-edge AgParks an innovative, scalable model that facilitates land access, technical assistance and shared resources for multiple beginning farmers, and also provide fresh food and educational opportunities for nearby communities. The AgPark concept stems from the nexus of three simple ideas: (1) to thrive, new farmers need support, including technical assistance, financial support and an engaged public; (2) ‘learning hubs’ such as the AgPark can attract capital investment and facilitate provision of technical assistance, both needed by new farms; and (3) the most critical place to engage the public and to create common ground between urban and rural interests is in the interface between the two, on available land at the urban edge. In short, AgParks are defined as multifunctional places that integrate collaborative sustainable farming, public education and natural resource stewardship and that link farmers and nearby communities for their mutual benefit. • Others, including local community groups, government agencies, schools, educators and public education organizations, members of the local, organic and sustainable food movements, and members of the environmental movement, who want to assess engagement with and support for AgParks.